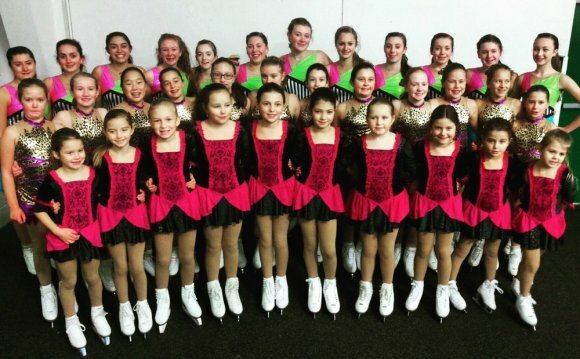 "I have been figure skating since I was 7-years old and have competed in synchronized skating with Team Spirit on and off for the last 5 years. I returned last January and got addicted again! I’m currently studying Nutrition at Oxford Brookes University and travel to Cardiff weekly for training and hope to apply some of my knowledge to the Team to help us become our fittest. After attending the World Championships in April 2014, I’m even more determined to compete to a better standard next season. Over the past 5 years I have been lucky enough to make some great friendships from those I have skated with and am grateful for the brilliant atmosphere the team creates on a weekly basis, making every training session productive but also fun. I’m looking forward to see where the following seasons take us!" all involved in getting us to where we are now. Natalie x"
"Hi, I'm Hannah, I really enjoy skating within all disciplines. I hope to try dance out for timing and edges, which will help with synchro. I am also a figure skater and one day I hope I will be as successful as I am with synchro. Synchro has really inspired me. It motivates me to know I can get somewhere and be good at what I love and I thank team Spirit and my coach for this. Since going and returning from Worlds, I am very motivated to go to the gym and become fitter for next season.Bring it on! WWSSC open their arms lovingly to new people wanting to join in, it's a great experience so grab it whilst you can!